They were giving Mac Jansen the business in the locker room after the game. The White Bear Lake senior had just scored four goals against Cretin-Derham Hall in a surprisingly lopsided 7-1 triumph on Saturday, Dec. 18, at the St. Croix Rec Center in Stillwater. Naturally, Jansen was the center of attention as the Bears playfully recounted what had just happened. “You could have shot it from behind the net, and it probably would have went in,” was one of the comments directed Jansen’s way. That notion doesn’t seem too far fetched, given that Jansen seemed to have the ability to put the puck wherever he desired, whenever he wanted. Jansen ripped a shot into the net off the crossbar, went high again on a gorgeous breakaway move and, just when it seemed like he might be done for the day, added the final scene to his one-man highlight reel with goal No. 4. That one came off a slapshot from the top of the circles. It’s tempting to say Jansen had a game of lifetime, until you look at the scoresheet from the Bears’ 5-2 victory over East Ridge two days earlier. Jansen had a hat trick in that one. 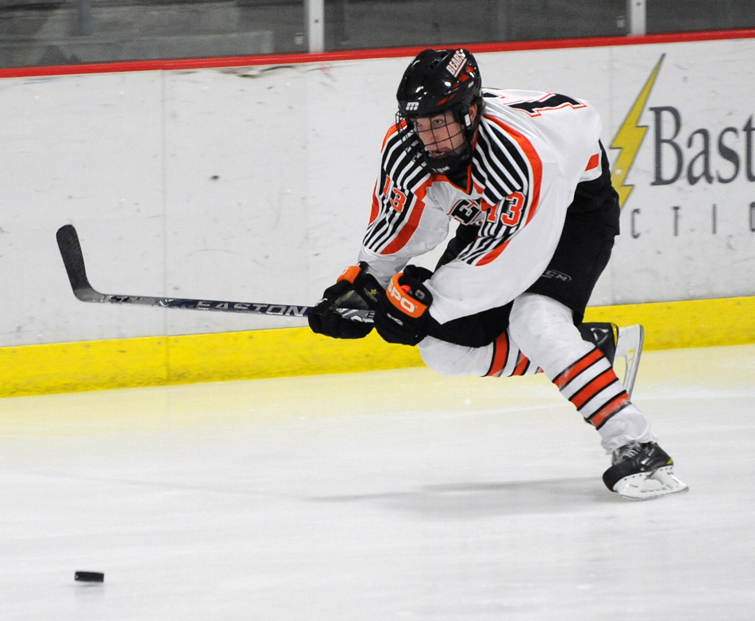 Oddly enough, White Bear Lake coach Tim Sager wasn’t overly pleased with Jansen’s performance against East Ridge. When Sager looks at Jansen he sees a player who packed on 25 pounds of muscle in the offseason, a player who has exceptional speed and soft hands. Sager’s point, in critiquing Jansen after the win over the Raptors, was that he didn’t see that same Jansen on the ice against East Ridge. Jansen’s performance against the Raiders came at an opportune time for the Bears. White Bear Lake standout forward Max Birkinbine watched the game against Cretin-Derham Hall in his street clothes. Birkinbine couldn’t play because of the carry-over misconduct penalty he received against East Ridge, a game that ended with an ugly altercation in the closing seconds. Power forward Matt Glasgow also received a match penalty against East Ridge and was out of the lineup. “It’s tough, because he is a huge part of our team,” Jansen said about playing without Birkinbine. “We had guys that don’t usually play a regular shift and they came out and played good. In a Suburban East Conference race that has been incredibly balanced and wildy unpredictable, White Bear Lake stamped itself as the early league favorite with its dominating 7-1 win over Cretin-Derham Hall. The Bears lead the league with a 4-0-0 record and eight points. Stillwater, which beat Mounds View 6-3 in the finale of the conference’s “Hockey Day” at the St. Croix Rec Center, is 3-1-1 and Roseville is 3-1-0. 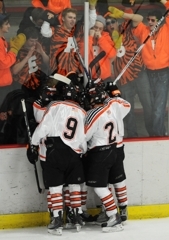 White Bear Lake (5-1-0) has not played Stillwater or Roseville yet this season. The conference race now gets put on hold with the arrival of “Hill-Murray Week.” The Bears host the arch rival Pioneers on Thursday, Dec. 23, at their new home rink, Vadnais Heights Sports Complex in Vadnais Heights. 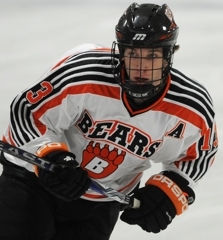 “It’s going to be a good challenge for us,” White Bear Lake senior Mac Jansen said. “We have an off day (Sunday) and then it starts Monday in practice. 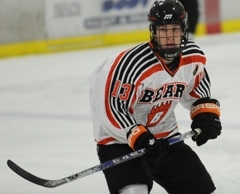 Senior Mac Jansen scored four goals, giving him seven in his last two games, as White Bear Lake eased past Cretin-Derham Hall 7-1 on Saturday, Dec. 18, as part of the Suburban East Conference’s Hockey Day at the St. Croix Valley Rec Center in Stillwater. Jansen, who scored three goals in the Bears’ 5-2 triumph over East Ridge on Dec. 16, scored twice in the first period against Cretin-Derham Hall as the Bears (5-1-0) surged to a 4-1 lead. 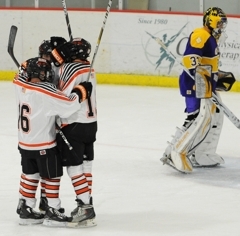 Jansen would score again in each of the second and third periods as his production more than offset the loss of star White Bear Lake forward Max Birkinbine, who sat out the game because of the misconduct penalty he received for his part in the melee that erupted at the end of the victory over East Ridge. Jansen has 10 goals and four assists this season. 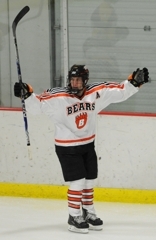 Senior Brandon Wahlin added two goals for White Bear Lake, which sits atop the Suburban East standings with a 4-0-0 record. Tyler Robert scored the lone goal for Cretin-Derham Hall (3-3-1), tieing the score at 1 midway through the opening period. 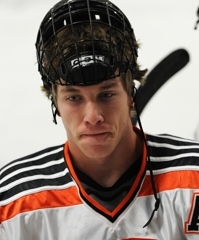 Jared Schletty made 17 saves for White Bear Lake. 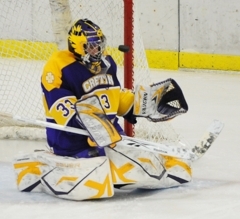 Joe Schneider stopped 17 of 24 shots for Cretin-Derham Hall. The senior forward made this pick ridiculously easy, scoring four times for the Bears. He twice ping-ponged shots into the net off the crossbar and scored another goal on a breakaway blast from long range. 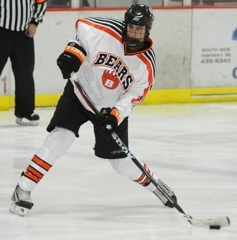 The Bears’ leading scorer with 20 points, Wahlin notched two goals and added an assist and was his usual elusive, effective self despite not playing with usual linemate Max Birkinbine (suspension). Schletty wasn’t particularly busy, but he did face the occasional flurry of shots and stood tall through all of them. He finished with 17 saves.